With part one of my whole home computing make-over complete, it’s time to get finish up on the lab! There are tons of other great blogs out there that talk about home labs (like this one, and this one, and this one, and this one, and this one…), and I definitely recommend you go through and pick what makes sense for you. There are definitely wrong ways to build a VSphere lab, but there are also many, many right ways to build one. Don’t get hung up on host count, NIC density, switch models and case types, just find something that fits into your budget, fits into your environment and does what you need it to do. 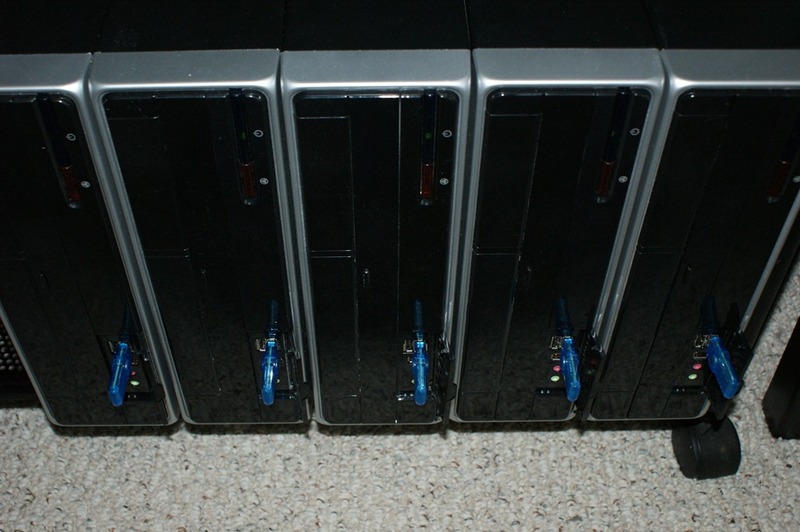 In my lab (as you may remember from this post) there are a total of five hosts. One host does nothing but management functions (vCenter, AD, etc…) and the other four are completely configurable. I wanted to stay away from virtualized hosts, if possible. This is 100% a personal preference, because when I’m buzzing around in the lab I don’t want to worry about how many layers nested in I am. There are still situations when I’ll use them, but one or two physical hosts wasn’t going to cut it for me. I wanted the hosts to be as close to 100% supported on the VMware HCL as possible. I hate troubleshooting some strange performance issue only to find out that it’s not supported by VMware. NICs, CPUs, I want to get as right as I can up-front. 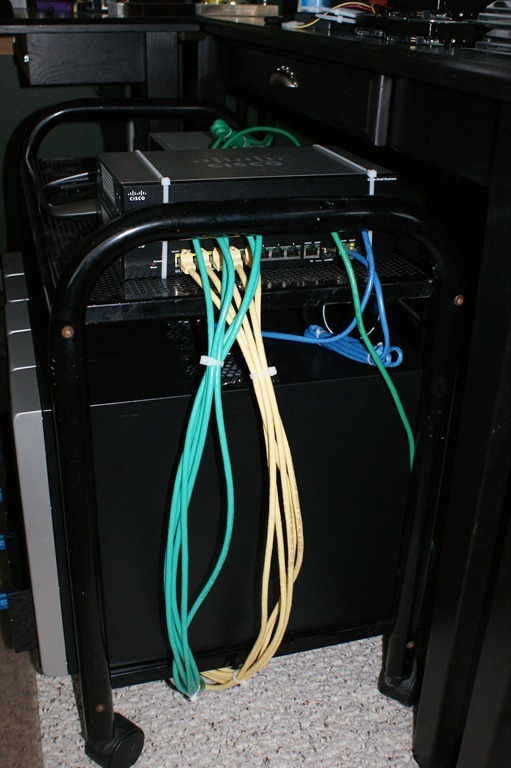 I wanted to be able to use VLANs to segment the different setups in the lab, but still be able to route between them. This was especially critical for the vCloud Director and multi-site labs (SRM, RecoverPoint, etc…), but in a classic case of want my cake and to be able to eat it, I needed something that was quiet and that I could use my existing Cisco skill-set to manage. I needed to be able to support multiple hypervisors and switch the lab hosts from one to another quickly. So the hardware order was a go, and if you want to see that again here’s the link to the NewEgg.com shopping cart. 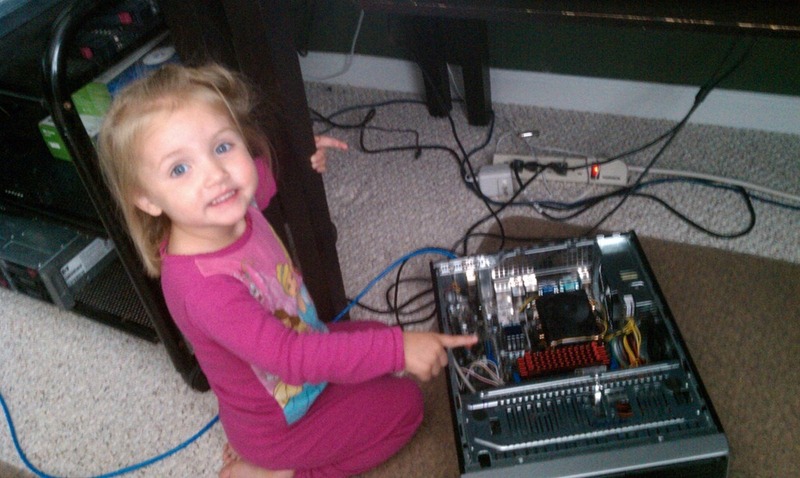 I went over the rationale for the hardware in my previous post, so we’ll skip to the actual Lab build process. The switches are sweet. 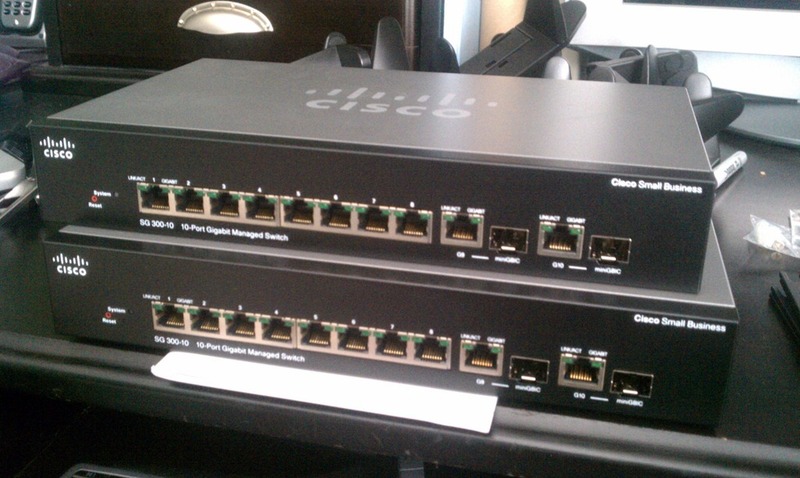 Completely fan-less, able to do ACLs/layer-3 routing and with a Cisco logo on them for less than $250, they may be the best lab switches I’ve ever had. The version of “IOS” that they run is…ummm…different, but the web interface is actually very, very good so that balances out. The NICs have also been perfect. I was worried about spending more for the dual-port Intel cards, but hearing about the issues some of my friends have had here, I’m glad I did. They have been 100% solid from day one, support wake-on-LAN and haven’t given me a bit of problems. I like the dual port card as well, since there aren’t a ton of available slots on the motherboard. After putting everything together on the rack and cleaning up the cabling, I have to say I’m pretty happy. 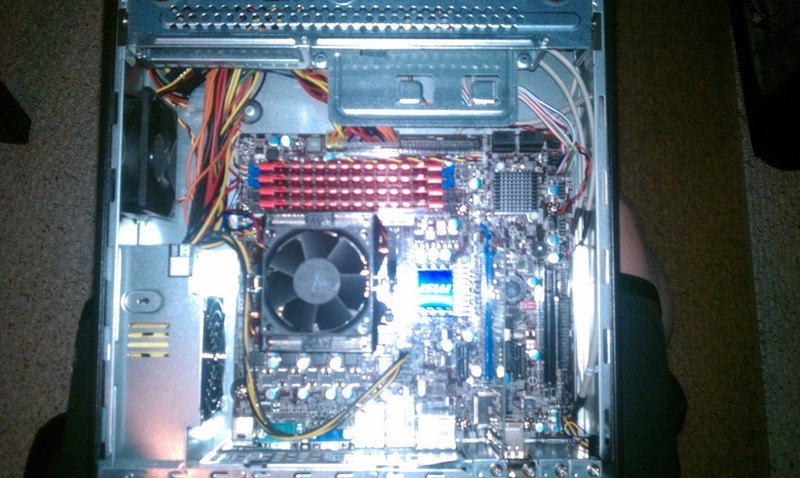 Here’s a couple pictures so you can see how it looks, and then we’ll talk about the VMware side of things. 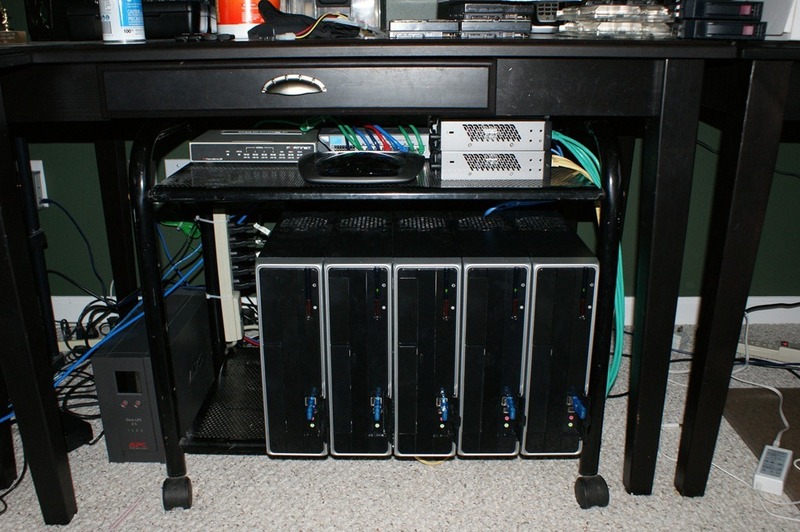 The rack is one I’ve had forever, and it fits perfectly under the desk in my downstairs office. It has three shelves, but I’ve removed the middle one to be able to fit all of the hosts in on their sides. The single fan on the sides of the hosts works great here! A liberal application of zip ties and everything is in place. On top, you can see the lab switches, and then the firewall, internal LAN switch and one of the wireless access points use in the house. The only real hole in the lab right now is the storage. 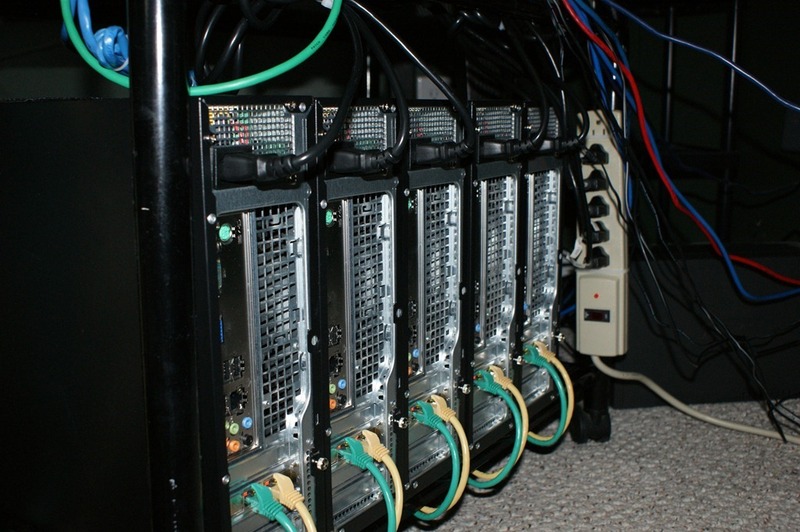 I have an old ReadyNAS NV+ array that doesn’t do iSCSI and that gets easily crushed by too many VMs. I’m going to have to figure something out there, but I’ve been looking longingly at the Synology DS1511+ as a replacement. We’ll have to see how it goes. 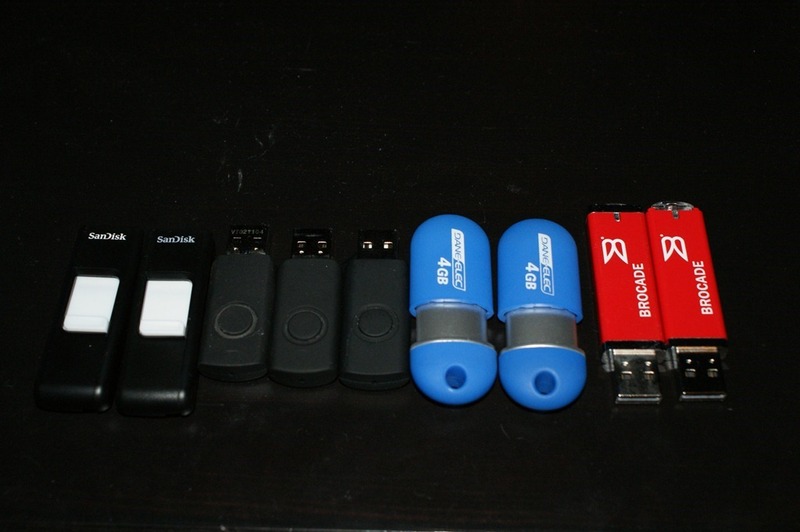 If you looked at the pictures, you may be asking what the USB keys are doing plugged into the front of the hosts. That was my answer to being able to quick switch between hypervisors! I have figured out how to boot almost every hypervisor I need from USB, so if I want to switch from one version to another, I just reboot the host and swap out the USB key! I have all the standards, including vSphere 4.1, XenServer, Xen 4.1.1 and Microsoft Hyper-V server. I’ve also got some new VMware goodness in there, and some stuff I can’t even talk about, but having everything on USB makes it super convenient. Want to see how different hypervisors work together? Want to split the four hosts into two sites? Now it’s easy! There’s more than enough horsepower to go around, so I can do what I want to do.